Golf cart battery cables require some periodic cleaning and maintenance or you may find yourself with a golf cart that won't start or dies suddenly, like my son-in-law's. My daughter was driving on the golf cart paths near her home when her EZ Go golf cart suddenly died. Fortunately, it was close enough to their house to push it back into the garage. As soon as I lifted the seat to look at the batteries, I pretty much knew what the problem was. The battery cables and terminals were full of corrosion. It is important to keep the cables and terminals clean to keep the power flowing. Corrosion can cause power to the golf cart to be disrupted at any point. 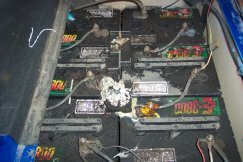 It's normal for battery acid to seep out of the batteries. You will notice a white, crusty material around the terminals and cables. If you don't clean off the corrosion the result is a shorter battery life, meaning you will need to replace them more often. 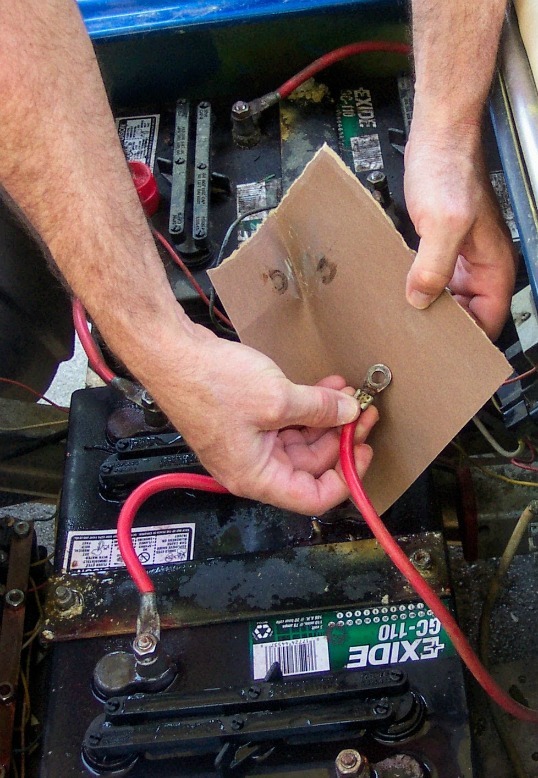 Always protect your hands and eyes with gloves and eye goggles when working with golf cart batteries. Remove any metal jewelry. Remember these are lead acid batteries and acid causes some serious damage to you, your skin, your clothes or anything else it touches. How to Check the battery cables and posts for corrosion. Is there a lot of dirt or corrosion like the above picture? All that white stuff is corrosion. I cleaned the worst battery terminals and cables of my daughter's golf cart with some sandpaper and a wire brush. Reconnected them, tightened the terminals and "voila" the cart started right up again. You can also clean the terminals with a solution of baking soda and water - but be sure none of the mixture gets into the batteries. You can apply the baking soda/water mixture as a paste with a tooth brush or put it in a spray bottle to spray on the neutralizing solution. Before applying all vent caps need to be tightly closed. Make sure the mixture covers all the corroded terminals and cables. Let it sit for at least 15 minutes. Use a cloth to wipe down the batteries. 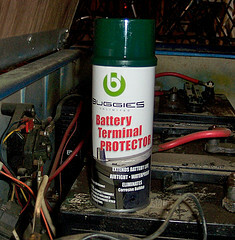 Battery post cleaners also work well to kill the acid on the posts. 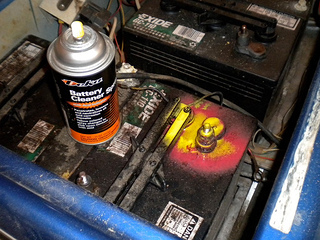 A battery terminal cleaner helps to loosen the corrosion. It turns red if acid is there and turns yellow once the acid or corrosion is neutralized. Once it is neutralized just wipe it off with a rag. Tighten all the terminals. Depending on the use, it's a good idea to check your battery terminals monthly for corrosion and to tighten the lugs. 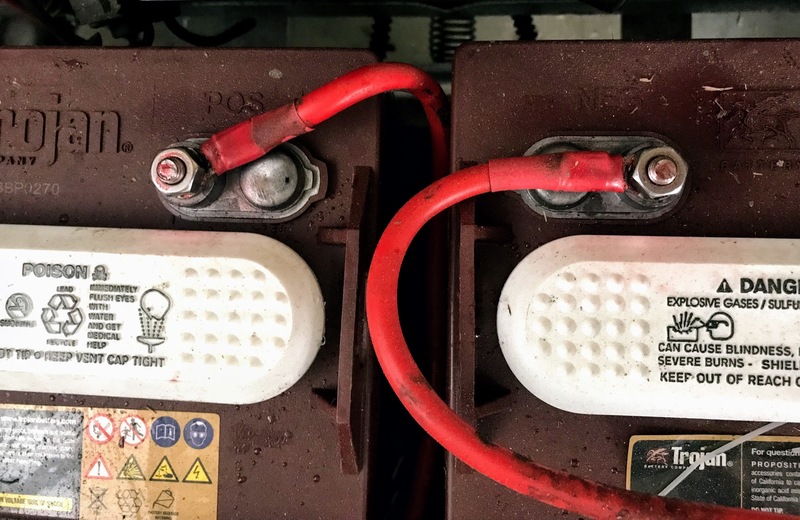 After your battery terminals are clean and free from all corrosion it's a good idea to put something on the terminals to prevent new corrosion from developing. You can apply a thin coat of petroleum jelly to the battery posts or use a commercial product like this Battery Terminal Protector. 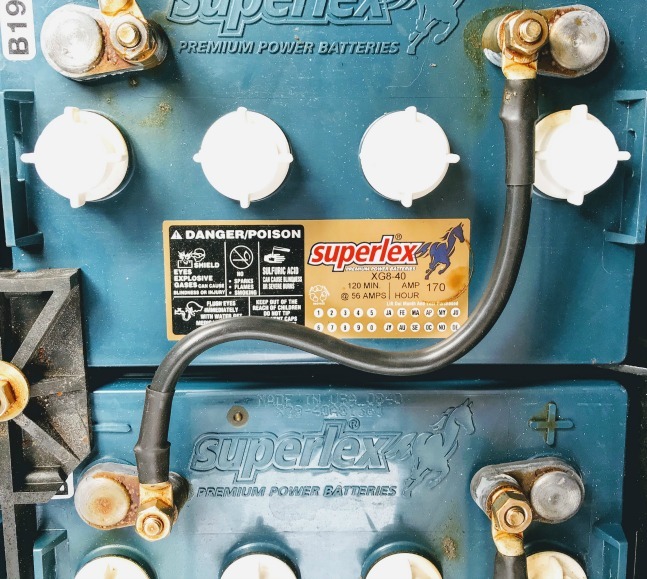 Either way, this protection does help to prevent your golf cart batteries from developing corrosion on the terminals and keeping them cleaner longer. Cables need to be checked not just for corrosion but to see if they are loose or frayed. If they are broken or frayed they need to be replaced. Golf cart battery cables can be purchased at on-line golf cart parts stores or Amazon. Some places will sell them as a single cable. The cables are available as 6 gauge or as 4 gauge. These golf cart parts are specific to a golf cart make, model and year. You will also need to know if you have a set of 36 volt batteries or 48 volt. 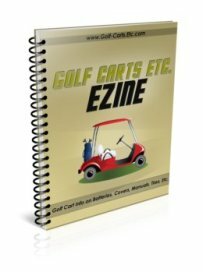 By performing regular golf cart battery cleaning of your cables and terminals you can improve the performance and reliability of your cart AND extend the life of your batteries.